VMware Cannot Upload Large ISO File? 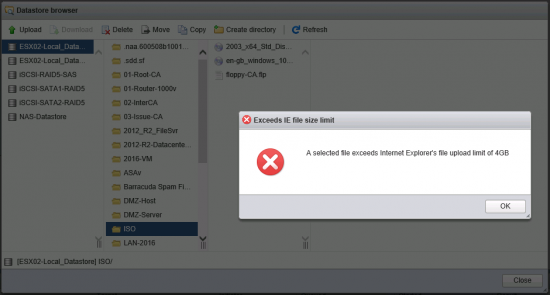 Home » ESX » VMware Cannot Upload Large ISO File? You may notice that even IE11 is limited to 4gb uploads, but that’s not a significant problem because websites should never try to upload large files (e.g. >50mb) directly in modern browsers. Right so who makes Windows 10?